Are you keen to start yoga, but aren’t sure where to start? I speak to so many Mums who would love to practice yoga, but something holds them back. I totally get it. Yoga can be really intimidating. I mean if you just flick through Instagram you would be forgiven for thinking that yoga is just handstands and back breaking backbends. As a qualified yoga teacher and creator of the Fit Mummy Project App which includes over 35 strength + yoga workout videos, it’s fair to say that I love yoga. But it wasn’t always that way. My background is in fitness. For many years I was a personal trainer and professional netball player. High intensity fitness was my thing! I thought yoga was boring and way to slow. When I fell pregnant with my first born, I discovered pre-natal yoga and I just fell in love with the practice. Yoga has so many amazing physical and mental benefits that are perfectly suited to life as a busy Mum. Here are just 4 quick benefits you can get from a regular yoga practice. • You’ll feel Calmer. Yoga helps you to practice mindfulness. By slowing down and focusing on your breath, you can notice your thoughts as they arise. This simple practice has helped me to see what thoughts are helpful to me, and which thoughts causing me unnecessary pain and drama. • You’ll have a better relationship with your body. Practicing yoga has helped to change my relationship to food and my body. Since practicing yoga I feel much more in tune with my body. I have stopped trying to push myself and I’ve stopped restricting myself. I just naturally make better food choices. Without any drama or feelings of deprivation! That alone is an awesome reason to practice yoga. • You will be better able to handle stressful moments. Stress accumulates in our body. I am a Mum to two little girls and I run a business from home. Some days I can feel the tension building in my body. Unless we do something to release the stress, we are like an elastic band pulled too tight. We will eventually snap. Yoga helps you to release some of that stress and tension in your body. • You’ll be a nicer person and Mother! By far the best benefit I have gotten from yoga is that it has made me a nicer person. I don’t take things so personally anymore. I am better able to watch my thoughts and see when I am being dramatic our acting out of my sense of ego. Trust me, I still have my bad days, but they don’t spiral out of control or turn into bad weeks as much as they used to. If you are keen to start a simple yoga practice that will help you to feel calmer, happier and more energised but have zero yoga experience, I have created this simple practice just for you! Before you start! Just like most forms of exercise, not all yoga poses are great for new Mums. You can read this post, where I recommend some simple modifications to your yoga practice to make it safe for postnatal bodies. For when you are feeling stressed or fatigued. This pose is great for calming your central nervous system and mind. If I am feeling a bit overwhelmed or cray-cray, I just bend forward and take five deep belly breaths. For when you want to feel calm and energised. Downward Dog is such a great full-body stretch, and also a perfect pose for those days you are feeling tired and drained. Because it is an inversion, it is also a really calming pose, so it is also good for reducing stress and calming your nervous system. For when you are feeling drained. If you are new to yoga, you may want to just practice Child’s Pose. It is a nurturing pose that helps you to ground your energy and connect to your body. For when you want to feel strong and confident. Warrior Two is a strong pose that strengthens your whole body, and can help to increase stamina and endurance. For my own part, I like to do it to feel grounded and strong. I like to imagine that I am just drawing up energy from the ground and building confidence and strength. I like to do this pose if I am doubting myself, as it is a very grounding pose and great for self-confidence. For when you want to feel balanced, focused and calm. Motherhood is such a juggle—sometimes you don’t know where you are or what you are doing. Tree Pose is a very balancing pose that calms your mind and central nervous system, and helps to bring some balance back to your mind and your day. For when you are feeling emotional. A lot of yogis believe that we store the energy from our emotions in our hips. That makes this a great pose to help release some of that blocked-up energy and tension from your day. It is also a great hip opener as it stretches your hips, groin and glutes and can also increase circulation to urinary, digestive and reproductive systems (another baby, anyone!). Want more yoga workouts you can do from home? 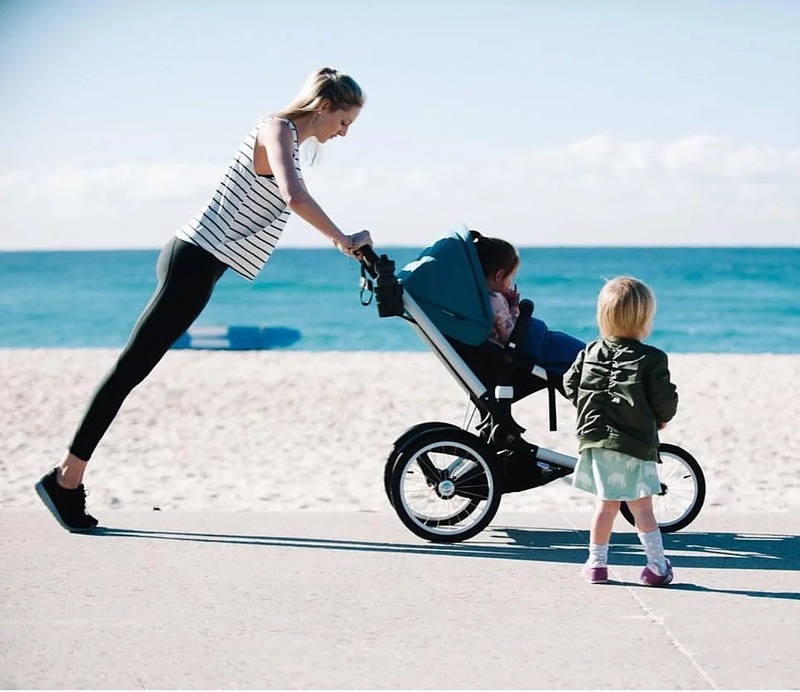 Get the Fit Mummy Project App! I have recently released the Fit Mummy Project App - the complete postnatal fitness and wellbeing App. The Fit Mummy Project App contains 15-20 minute early postnatal, strength, fitness, yoga, barre and meditation videos the you can do from home! You can start from as early as 6 weeks postpartum all the way up to 3-4 years after baby.